Since we're located, oh, a solid 2,400+ miles away from the West Coast -- pretty much smack in the middle of the Pacific Ocean -- folks who are local to Hawaii have a unique view of the continental US. 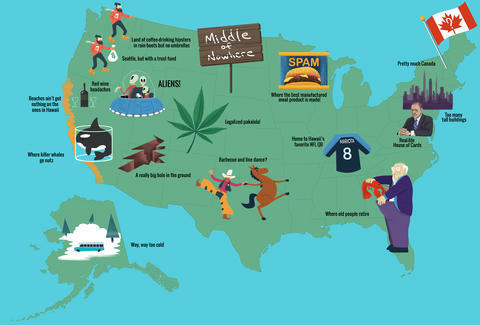 Here’s how the Aloha State envisions the rest of these United States. Click here to see a blown-up version of the map, or scroll down below. Amanda Zen is a freelance writer for Thrillist who would be into traveling to every state (... at least during the warmer months).